Some of the Martian impact craters imaged by the UA's HiRISE camera on the Mars Reconnaissance Orbiter were formed in the last 10 years or less. The HiRISE team met in Tucson the past two days and some of the discussion centered on recognition of craters that were not present in images dating back 10 years, meaning the impacts occurred sometime in the past decade. 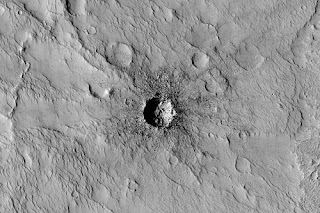 It sounds like the planetary scientists are surprised by the number and size of new craters discovered. On a national level, they project that coal will increase its share from 49% to 54% by 2030, as demand for electricity grows 1.1% annually. Natural gas will drop from 22% to 14% as costs rise. Renewable energy use should climb from 9% to 14% but greenhouse gases will still rise 16% because carbon capture and sequestration (CCS) won't be effectively implemented. The report notes these projections will all change depending on state and federal policy actions. Mary Poulton, chair of the UA Dept. of Mining & Geological Engineering, was interviewed in the new issue of Issues Brief, put out by Resolution Copper. In answering a question about the current economic downturn and impacts on copper and other commodity prices, she said a "defining factor toward recovery in the commodities market is the move toward green technologies, many of which are copper-intensive. For example, the US economy is largely influenced by the state of housing and manufacturing. 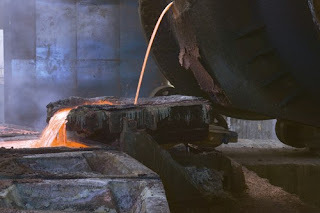 If we continue to innovate using green materials and energy-efficient technologies, we will necessarily see an increase in the need for copper..."
"Two major construction projects are underway simultaneously on the shaft. First, active shaft sinking using a temporary sinking setup began in late December 2008. To date, the shaft has progressed to a depth of 260 feet. At the same time, we’re constructing a permanent setup for the hoist and headframe to be completed by July." Their goal for 2009 is to reach the 1,100-foot level of the previous Never Sweat mine tunnel, then to begin full sink efforts on their way toward the 7,000-foot depth needed for the underground copper mine. To my fellow b loggers who are coming to Tucson for the gem, mineral, and fossil show these next two weeks - please stop in and introduce yourselves. 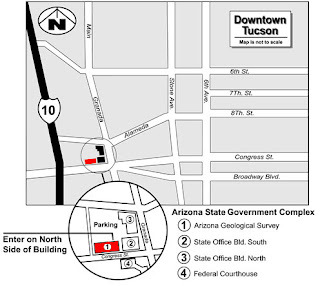 The Arizona Geological Survey is in the heart of all the action and we have free parking (but with a 2 hour limit). Our library is open to the public and a good place to blog from. Even while vendors are unpacking and setting up their booths and tents, all kinds of wheeling and dealing is going on around Tucson as the world's biggest gem, mineral, and fossil show gets ready to open on Saturday. I went out for a short walk over lunch and the city is buzzing. Trucks unloading, forklifts moving the big crystals and fossils, crates being pried open, and lots and lots of pre-show deals in the making. One Brazilian vendor just down the street from us sold 3/4 of his entire inventory yesterday. AGI's video entitled "Why Earth Science?" is on YouTube and getting a lot of attention among the blogging community. So, if you still have to explain what it is you do to family and friends, and why it's important, just show them this. It also shows why geology is so much fun. 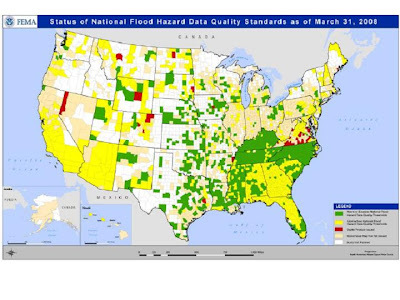 Arizona is not part of the 21% of the nation that has flood plain maps that meet all of FEMA's data quality standards, even after a $1 billion national map modernization program. As a result, the National Research Council issued a report (Mapping the Zone: Improving Flood Map Accuracy) this week on what is needed to improve flood map accuracy for protecting lives and property. The study concluded that "map accuracy would be increased by updating and generating information using high-accuracy topographic data, such as that generated by "lidar," which measures elevation using aircraft-mounted lasers." Just as importantly, the study focused on what information is needed to adequately convey risk. They state that "the maps and products must show where the flood hazard areas are located and the likely consequences of flooding, such as damage to houses or coastal erosion. Additionally, floodplain residents should know how their land elevation level compares with various possible flood heights, which will offer a finer discrimination of potential risk. Currently, maps that show only floodplain boundaries imply that every building in a designated flood zone may flood and every building outside the zone is safe." The global competition for energy is moving into the Arctic as we've seen bordering nations all making territorial claims. Now, AAPG and the Russian Geological Society (RosGeo) are holding the 3P conference (Polar Petroleum Potential) in Moscow at the end of September to examine the Pan-Arctic region, which may contain up to one-quarter of the world's undiscovered hydrocarbons. All the faculty and staff at ASU got an email from President Michael Crow late this afternoon, announcing mandatory furloughs to meet at least part of the expected state budget cuts. The full message is posted on the ASU web site along with a video. The furloughs are expected to save $24 million between now and June 30, the end of the fiscal year, but the university's total budget cuts may be much larger. The Post got a copy of a January 15 memo from Grand Canyon National Park Superintendent Steve Martin, in which he wrote, "The government's brief as presented continues to misinterpret key scientific findings related to the humpback chub, status of downstream resources in Grand Canyon, and the need for the Secretary to acknowledge [National Park Service] authorities and responsibilities to protect resources under [National Park Service] administration." U.S. Rep. Nick Rahall (D-WVA) reintroduced his proposed revision of the 1872 Mining Law today, with a bill identical to the one that passed the House in 2007. The measure would impose a 4% royalty on existing mines and an 8% royalty on new mines. 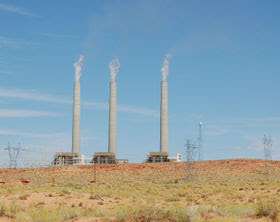 The Congressional Budget Office says approximately $1 billion in non-coal metals are produced on federal lands each year. It follows on the heels of yesterday's release of the Pew report cricitizing the existing law. 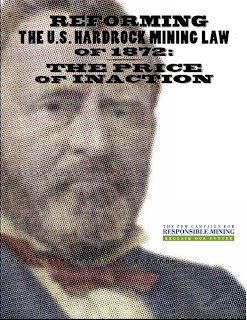 The Pew Campaign for Responsible Mining released their critique of the 1872 Mining Law yesterday, "Reforming the U.S Hardrock Mining Law of 1872: The Price of Inaction." Congresswomen Gabrielle Giffords of Tucson is the newly elected chair of the House Space and Aeronautics Subcommittee, of the Committee on Science and Technology. This is of importance for the nationally prominent UA and ASU programs in planetary and space sciences and astronomy. the most important in shaping the planets and other bodies in space." honor bestowed by the U.S. government on scientists and engineers beginning their independent careers. Vivoni received a 2007 award, announced by the White House in December 2008. His website describes him as "a hydrologist whose is interested in the interactions of water in the lithosphere, biosphere and atmosphere. 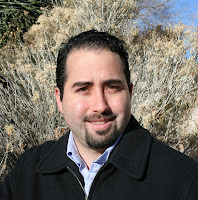 His current research focuses on land surface ecohydrological processes in the semiarid southwestern United States and northwestern Mexico." Word from AGU is that long-time Executive Director A.F. 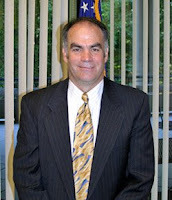 (Fred) Spilhaus, Jr. has stepped down after 39 years at the helm of the group. 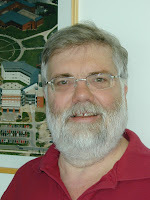 Under Fred's leadership, AGU grew from a small U.S. National Committee of the IUGG to an international organization with over 55,000 members. An executive who specializes in interim leadership of associations and nonprofits, Robert T. Van Hook, has taken charge as Interim Executive Director. Freeport McMoRan Copper & Gold stunned everyone with their earnings report this morning: $13.9 billion loss in 4th quarter 2008, a 9% drop in copper sales estimates for 2009, and 17% for 2010 estimates. One of the statements that caught my attention in the 9-page report was that costs at Freeport's North American copper mines (4 in Arizona, 1 in NM) ranged from $0.05 per pound "at one mine" to $1.95 at the Morenci mine on a net cash basis. With copper up from its low of about $1.25 to the current $1.50, that would seem to put Morenci at risk. But Freeport describes the cost-cutting and production cuts already implemented. Those, and reduced input costs, will mean that average production costs in 2009 should be about $1.17 on average, with the most expensive mine at $1.25 per pound. MJC, who blogs at Geotripper, has been posting in recent weeks from Cretaceous locales on the Colorado Plateau. His new one from the Black Mesa area on the Navajo Reservation covers geology and a pointed view on the coal development history. Mark Myers, who resigned as Director of the USGS with the Obama Administration changeover, has been hired by Alaska governor Sarah Palin as pipeline coordinator for the Alaska Gasline Inducement Act (AGIA) project. He will "oversee the review and issue of permits for construction of the massive pipeline which will deliver North Slope natural gas to the Lower 48." This is reported on the Sarah Palin for President blog. It includes a nice short bio for Mark as well. The new report about global warming causing increased tree deaths was published yesterday in Science, supported by 5 press releases, a press teleconference, podcast, and piles of supplementary materials. It's been reported by every major news and science outlet with some worrying that this is the start of something more serious. NAU associate professor of Forestry, Pete Fulé is one of the coauthors of the article "Widespread Increase of Tree Mortality Rates in the Western United States." Fulé worked with NAU researchers to provide tree measurements from more than 6,000 trees, mostly ponderosa pines, rooted in the Gus Pearson Natural Area established in 1908 and located within the Fort Valley Experimental Forest 12 miles north of Flagstaff. Trees in the experimental forest can reach beyond 500-years-old. A report in today's Arizona Daily Star, says Asarco's Mission mine will now buy 80% of its water needs from CAP water belonging to the the Tohono O'odham Nation, rather than using groundwater. It's part of a settlement of decades-long litigation over groundwater pumping. 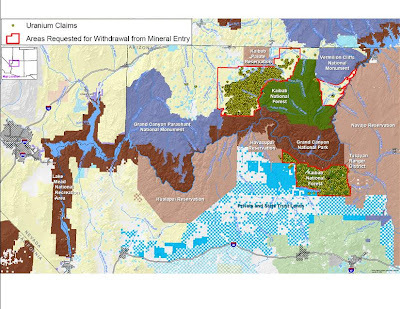 News reports say Rep. Raul Grijalva and Ed Pastor have introduced legislation to limit uranium exploration on about 1 million acres north and south of the Grand Canyon, including in the Kaibab National Forest. There are no announcements on either rep's web pages, nor any record of the bill at OpenCongress.org (which has become my favorite site to track Congressional actions). Following the strategy meeting of Science Debate leaders and advocates at ASU in Tempe two weeks ago, the organization is calling on its 38,000 members to weigh in on the future directions of the organization. An email went out to the members yesterday asking them to share their visions. The general consensus is that Science Debate 2008 had a profoundly positive impact on the 2008 elections and the incoming administration. Science is once again getting America's attention as indicated by proposals to add billions of dollars to research budgets for economic recovery and investment, the appointment of several early and highly respected Science Debate 2008 supporters to key positions in the Obama administration, and the President's powerful comments about science in his inaugural address. 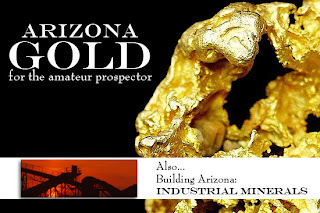 AZGS has put 12 of our gold-related publications on our web site in free, downloadable versions. Many of these have been out of print for years and hard to find. More publications will be added as we finish scanning them. Exploration and Development of Small Mines, 1954, H.E. Krumlauf (Bull 164); Outdated but historical treatment of small mine development. Red Desert- missing link to origin of the Grand Canyon? 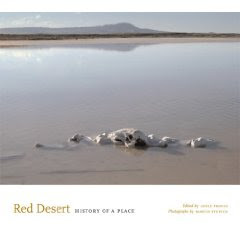 Arizona Geological Survey geologist Charles Ferguson has the lead-off chapter in a new book, Red Desert, History of a Place, edited by A. E. Proulx and published by University of Texas Press. 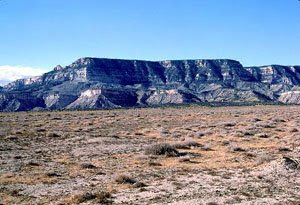 During research for this project, Charles uncovered inconsistencies regarding the Plio-Pleistocene history of the Red Desert that that may provide an important missing link to explain how the Colorado River suddenly and rapidly incised the Grand Canyon approximately 5 million years ago. "A vast expanse of rock formations, sand dunes, and sagebrush in central and southwest Wyoming, the little-known Red Desert is one of the last undeveloped landscapes in the United States, as well as one of the most endangered. To capture and preserve what makes the Red Desert both valuable and scientifically and historically interesting, writer Annie Proulx and photographer Martin Stupich enlisted a team of scientists and scholars to join them in exploring the Red Desert through many disciplines—geology, hydrology, paleontology, ornithology, zoology, entomology, botany, climatology, anthropology, archaeology, sociology, and history." BLM is setting up Renewable Energy Coordination offices to expedite the permitting of wind, solar, biomass, and geothermal projects, along with needed electrical transmission facilities, on BLM-managed lands. The action was taken by out-going Interior Secretary Dirk Kempthorne to achieve the Congressional goal in Section 211 of the Energy Policy Act of 2005, which calls for the development of 10,000 megawatts of non-hydropower renewable energy projects on the public lands by 2015. 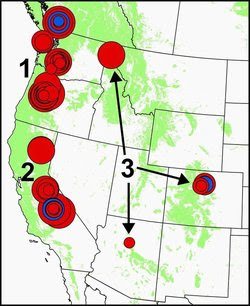 A couple months ago, BLM released their plans for geothermal energy development in the Western U.S. which focused on the Basin and Range areas of Arizona, but left out the San Francisco Volcanic Field, which may have some of the best geothermal potential in the state. 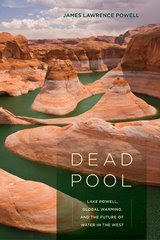 A review in Science of the new book Dead Pool - Global Warming, and the Future of Water in the West quotes the author James Lawrence Powell as warning that the over-appropriation of Colorado River water could result in Phoenix being depopulated like "a Grapes of Wrath-like exodus in reverse." Powell argues there is only enough water to fill Lake Mead but not Lake Powell, so the latter should be eliminated before it just fills with silt. University of California Press, Berkeley, 2008. 298 pp. $27.50, £19.95. ISBN 9780520254770. The Southwest will get drier, with more droughts and, paradoxically, more floods, according to Jonathan Overpeck ("Peck") in his opening remarks to the "Adaptation to Climate Change in the Desert Southwest: Impacts and Opportunities" conference which is being held in Tucson today and Friday. 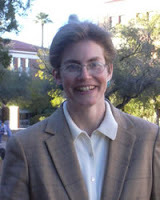 Peck is geosciences professor and director of the Institute for Environment and Society at the UA. He said, "The scary thing is that what has been projected is actually happening," and warned that more climate change is a sure bet and natural variability could make it worse with a megadrought that could persist for decades. As a result, he said "We should be adapting to make ourselves resilient to this kind of catastrophe." A panel that followed concluded that climate change in arid lands has very likely increased the size and number of forest fires, insect outbreaks, and tree mortality in the western and southwestern U.S., and is projected to cause changes in other natural processes. UA released the list of public lectures in the NEXT series: Science That Transforms. You should read the details of each lecture at the web site. Each one is provocative and fascinating. The lectures are free and open to the public and will begin at 7 p.m. on Tuesdays beginning Jan. 27. The lectures will be held at Centennial Hall, 1020 E. University Blvd. on the UA campus in Tucson. BHP Billiton announced today they are laying off 550 workers from their Pinto Valley copper mine near Miami, as part of a worldwide reduction of 6,000 employees, mostly in nickel mining. BHP lists a total of 600 employees at the mine (370 BHP and 270 contractors), so this would appear to indicate the mine is being shut down with perhaps a small maintenance staff staying on. On the same day the new President proclaims "We will restore science to its rightful place," the Arizona State Senate held a hearing on shutting down Science Foundation Arizona (SFA). SFA is considered one of the most innovative programs in the nation for investment in science for economic development. The Senate Appropriations Committee is calling in state agencies this week that have been targeted for elimination as described in budget 'options' released on Friday. SFA is actually an independent 501(C)3 non-profit operation funded through the Arizona 21st Century Fund. The Legislature's proposal is to zero out the FY09 and FY10 budgets of that fund, effectively shutting down SFA. According to the SFA web site, the Governor and State Legislature appropriated $35 million to Science Foundation Arizona through the Arizona 21st Century Competitive Initiative Fund in June 2006. The goal was to develop the necessary resources for Arizona to become globally competitive in science and engineering. In June 2007, the State Legislature approved a four-year commitment to Science Foundation Arizona for an additional $100 million to be matched by the private sector, making the total investment for innovation and growth $235 million through 2012. It may be freezing and snowing in many areas of the country, but this is prime field season in Arizona. AZGS mappers are working on 5 new geological quadrangles [right, in dark purple] as part of the STATEMAP component of the National Cooperative Geologic Mapping Program managed by the USGS. The quads were selected by our external State Mapping Advisory Committee. The map at right shows all the 1:24K and 1:12K scale geologic maps produced by AZGS since 1978. This years maps include Dolan Spring in the northwest, Chino Valley North near Prescott, and three quads adjacent to the proposed Rosemont copper mine south of Tucson - Helvetia, Springwater Canyon, and Empire Ranch. A driving factor in the choice of all these areas is to provide geologic insights and constraints on groundwater resources. This round of mapping is scheduled to be complete by mid-September, with public release of the quads a few months after that. Ken Salazar, nominee for Interior Secretary will be taking a pragmatic course, based on his testimony in his confirmation hearing last Thursday before the Senate Energy & Natural Resources Committee. His approach seems very much in line with the overall direction of the Obama administration. He gives priority to ‘sensible’ reform of the 1872 Mining Law. 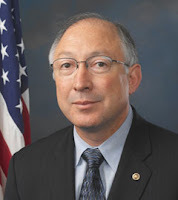 Sen. Salazar said he understands the importance of mining, but called for stronger [environmental] standards than what exists in the law. Even the mining industry recognizes the need to make changes, but the debate is over the extent and nature of revisions. Salazar also spoke about abandoned mines as a “scar on the public domain that has had huge environmental consequences." Giant tents are going up all over Tucson in preparation for the Gem, Mineral, and Fossil Showcase that kicks off in less than two weeks. The tent city shown to the right is across the road from the AZGS offices and the federal court building is visible in the right rear. Tents are filling empty lots, while entire motels are being converted into bazaars. A guide to the 46 or so shows contains maps and shuttle routes. 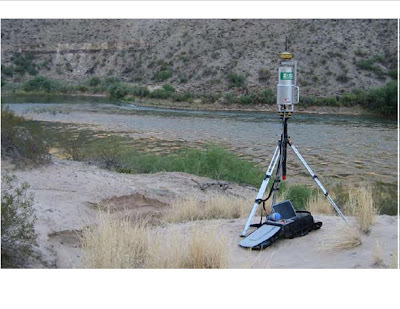 The USGS is testing ground-based LIDAR systems [right] for monitoring geomorphic changes at archeological sites in the Grand Canyon. The hope is to mitigate the detrimental impacts caused by repeated surveys that ironically are intended to preserve the sites. USGS has published a new report that sounds pretty encouraging about the use of this technology. Last week, during the ScienceDebate strategy meeting at ASU, host Lawrence Krauss announced to us that he will co-chair the Board of Sponsors of the Bulletin of Atomic Scientists with Nobel Laureate Leon Ledermen. Together they plan to re-energize a national discussion on the reduction of nuclear weapons stockpiles, and a commitment to fight proliferation and encourage disarmament efforts. Most of us are familiar with BAS' famous 'doomsday clock' that has shown the Earth often just minutes away from nuclear war. Lawrence is a theoretical physicist and cosmologist in the School of Earth and Space Exploration and director of the new “Origins” initiative at ASU. A press release from the Bulletin says the role of the Sponsors, founded in 1948 by Albert Einstein and first led by J. Robert Oppenheimer, is to support the efforts of the Bulletin to amplify voices of reason and encourage rational policymaking on nuclear weapons, nuclear energy, climate change and biotechnology. The board has 44 members and includes 17 Nobel laureates. Lawrence was named to the Board of Sponsors in 2006, along with Stephen Hawking, Lisa Randall and Brian Greene. 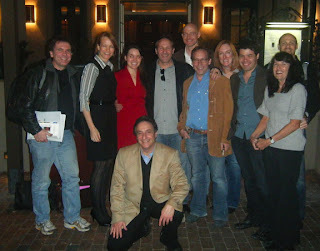 Scientific American has described Krauss as a public intellectual. Among his six books is the best-seller, The Physics of Star Trek. The Chilean copper think tank CESCO predicted similar conditions with copper prices ranging from $1.50 to $1.80 per pound for the year. That's actually an improvement over recent lows of around $1.25. The uptick is attributed to stronger purchases from China in December. These two forecasts assume there will be production cuts and cost efficiencies overall as companies cut back on their most expensive operations. Congressional and Administration leaders are telling scientists to 'think bigger' in proposing plans for investment in R&D and technology, because science means jobs. There's a penetrating report in this week's issue of Science where House Speaker Nancy Pelosi is quoted as telling a panel of scientists including geophysicist Maria Zuber from MIT, that the "[America] COMPETES Act is good. But ask for all of it now, and think bigger." That would double the NSF and DOE Office of Science budgets over 7 years. The Association of American State Geologists released our Geoscience Recovery & Reinvestment Program last week and state geologists have been talking with our Congressional contacts about the 2,900 jobs it would create, including in AZGS. A delegation of state geologists are heading to DC on Thursday and Friday to meet with key Members and staffers to explain how the proposal fits in the emerging national plans. Wayne Ranney's posted an excellent summary at his blog site, Earthly Musings, of the articles, books, and debates over Grand Canyon geology that were published last year. I agree with Wayne's assessment that the debate over the age of the canyon will continue into 2009 along with publication of a lot more studies, including a GSA Special Paper that is forthcoming. ADEQ's newly released study on Ambient Groundwater Quality of the Agua Fria Basin found that 30% of the 46 sites sampled "had concentrations of at least one constituent that exceeded a health-based, federal, or State water quality standard." 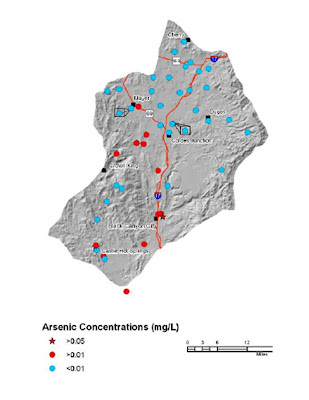 The report said the cause of the elevated arsenic concentrations is uncertain, but noted that in Arizona "such conditions are often associated with clay-ric sediments, volcanic rocks, geothermal environments, and/or areas with gold deposits." All of those rock types are present in the area, so the natural presence of arsenic is not a surprise. Did you feel the Earth shake this afternoon? It wasn't an earthquake. It was the crowd stomping at the stadium in Glendale, as the Arizona Cardinals completed an 8-yard touchdown pass from Kurt Warner to Tim Hightower with 2:53 to play, upsetting the Eagles, and winning the NFC Championship game. Now, on to the Superbowl. Meanwhile, I'm watching for more signs, like pigs flying and frost in Hades. The New York Times compiles spectacular sets of science and nature images in their online slideshow series. "Postcards from Mars" is now up with a set of outstanding pictures from the UA's HiRISE camera aboard the Mars Reconnaissance Orbiter spacecraft. The Arizona Legislature released budget 'options' on Friday but only one of them has details, so that version is widely viewed as the preferred plan. That option is receiving criticism about the impacts on education and health services so there is uncertainty how it may change. In this option, the AZGS is targeted for a 10% across the board cut in our FY09 funds plus a 4.2% cut in personnel costs for a total reduction of 12.6% of our annual budget. But since we are halfway through the fiscal year, that means a 25% cut of the remaining budget between now and July 1. All agencies, including AZGS, are given the following guidelines in implementing these reductions: "State agencies would have the flexibility of determining how to implement this reduction in their personnel costs. These actions could include a furlough, pay reduction or other management actions." In anticipation of the Legislature taking such action, AZGS has been working with the Governor’s Office of Strategic Planning and Budget for the past couple of months to reallocate our appropriated state general funds. We cut costs (turned in one of our 6 fleet vehicles, converted the Arizona Geology newsletter to digital, etc), moved state funded-staff members to contract funds, and will use all of our overhead funds this year. We expect this combination will allow us to get through the next six months without layoffs or furloughs. While this is encouraging, the cuts mean we will be able to carry out a lot less of the work mandated in statute for the Survey. For FY10, starting July 1, our base cut would be 15% plus a 10% reduction in personnel costs, for a total of about 21% reduction from our FY08 base. That is going to be more challenging to handle. While the current financial situation looks grim, we are taking control of our destiny. A lot can, and likely will happen between now and the next fiscal year. We are aggressively pursuing alternative funds. We have more proposals being prepared right now than ever. We are also working with Congress on stimulus proposals that would bring large projects to us. A delegation of politically-savvy state geologists will be in DC at the end of the week working to get the Geoscience Recovery & Reinvestment Program incorporated into Congressional bills. I missed the public presentation last Wednesday about the plans for the UA science center and state museum, so thought I could see the details online. Unfortunately, there's not much there. A few pictures [right, credit, UA State Museum], a map showing where it will be built, and a video with people exclaiming how great it will be. The FAQs are about why the community should support the facility and minor things like whether there will be a snack bar. For a project that is supposed to start construction this summer for a 2012 completion, I expected a lot more about what the center will offer, what's so special, what is going into it, etc. Such a description must exist somewhere but I haven't found it. 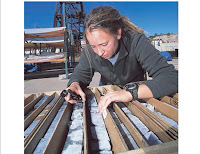 Geologists will review the state of the profession in Arizona next month in an annual program organized by the Arizona Chapter of AIPG. AZGS will once again host AIPG and guests in our Tucson office on Saturday morning, Feb. 14 from 9 am to noon. 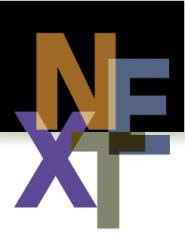 Representatives from state and federal agencies, professional societies, and others will offer brief informal reviews of 2008 and insights into 2009. In addition, the AIPG national board of directors will be in town for their mid-year meeting and most will participate in our Arizona session. The event is open to everyone in the geology community, although space is somewhat limited. It's a great forum to catch up and touch base with our colleagues around the state. A lot of folks from out of town come down for the program and head down the block afterwards for the Tucson Gem & Mineral Show in the convention center.